One highlight on clear moonless nights is not a faint nebula or even a single constellation but our majestic Milky Way Galaxy. From a dark site, the familiar veil of light stretches from Perseus in the North East, up through Cygnus overhead and down to the heart of our galaxy – just to the right of Sagittarius. August nights are now getting a bit longer and cooler to a certain extent. This is a plus when it comes to observing the night sky. No matter if you are hunting down your favourite objects with a telescope or pair of binoculars, to see the arms of the galaxy in all its glory, cannot be put into words. I still like to look up with just my eyes as I did when I first started astronomy at the tender age of eight. In my young days, summertime meant my parent heading off to the drive-in movies in Champlain, New York. If skies would allow, my entertainment was not on the silver screen but the sky above. The first telescopic object I like to show people when I give star nights is the most beautiful double star in the night, Albireo – the head of Cygnus the Swan. Albireo helps illustrate that stars are not white but do come in a range of colours. Lying only 380 light years (ly) away, the components show contrasting as blue and yellow. In fact, the yellow star is a close double in itself that cannot be split with a telescope. It has not yet been determined if Albireo is a true binary star but if it is; it would take more than seven thousand years for one to dance around the other. Moving south from Albireo we come across M27 aka the Dumbbell Nebula. This is one of the finest examples of the aftermath a star that died some 14,000 years ago. At 1,250 ly from us, we see good detail in its magnitude 7.4 structure. But even its large size (one-fifth the moon’s width); we still have a difficult time catch the magnitude 13.5 magnitude star. To the north of Albireo is the familiar constellation of Lyra the harp. Its main star is called Vega which is one component of the famous summer triangle and is 25 ly away. Vega has been studied in depth over the years and it seems to have a dusty disk around it – meaning a possible Jupiter sized planet in orbit. 12,000 years ago, Vega was considered the pole star and because of the Earth’s 26,000 year wobble called precession, it will be crowned the pole star some 14,000 years from now. Vega is close to three times wider than the Sun and is 50% hotter. It has an extremely fast rotation period of 12.5 hours with centrifugal forces causing the star to take on an elliptical shape and is close to coming apart..
An excellent test for your telescope optics and collimation is the twin stars to the upper left of Vega. I call this the Tim Horton’s star but more widely known as the double – double. With a medium power eyepiece, each of these stars is itself a very close double. See if you can split them. 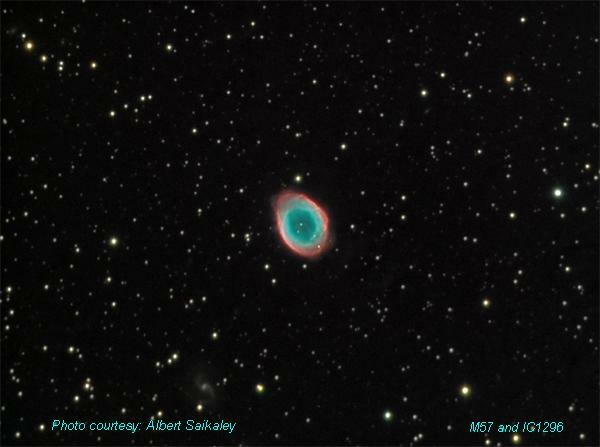 Located in the lower portion of the rectangular box is another favourite planetary called the Ring Nebula. Catalogued as M57 the illusive central 14th magnitude central star can be glimpsed with large instruments and of course photography. The ghostly smoke ring is located twice as far as the Dumbbell or 2,300 ly and has a fainter magnitude of 8.8. If you are up for a challenge, move a little more than 4 arc minutes to the right of the Ring and try to locate IC1296. At magnitude 15.0 you have probably seen area many times when looking at the Ring but did not know of galaxy’s existence. Nicely lined up between Albireo and Lyra’s rectangle star Gamma, is a remote globular cluster M56. It is one of the dimmest Messier objects weighing in at magnitude 8.3. Lying close to 33,000 ly from us, the cluster is not very well resolved. Move your scope along the Swan’s neck until you reach the intersection with its out stretched wings. This star is call Sadr or gamma Cygni. Surrounding Sadr are patches of nebulosity with the entire association called IC 1318. Measuring some four degrees wide, no less than five areas comprise this object. Wide angle photography will help reveal this nebulous region. While in this area of sky, do look for the Crescent Nebula – NGC 6888 or also known as Caldwell 27. Resting some 5,000 ly from us this emission nebula a shock wave is formed by the fast moving stellar winds from the magnitude 7.4 Wolf-Rayet star WR136, colliding with slower moving winds from a star for became a red giant about 400,000 years ago. Now slide down the eastern wing until you come across 52 Cygni. A wide angle eyepiece and an OIII filter is required to enjoy the large but incredible Veil Nebula. 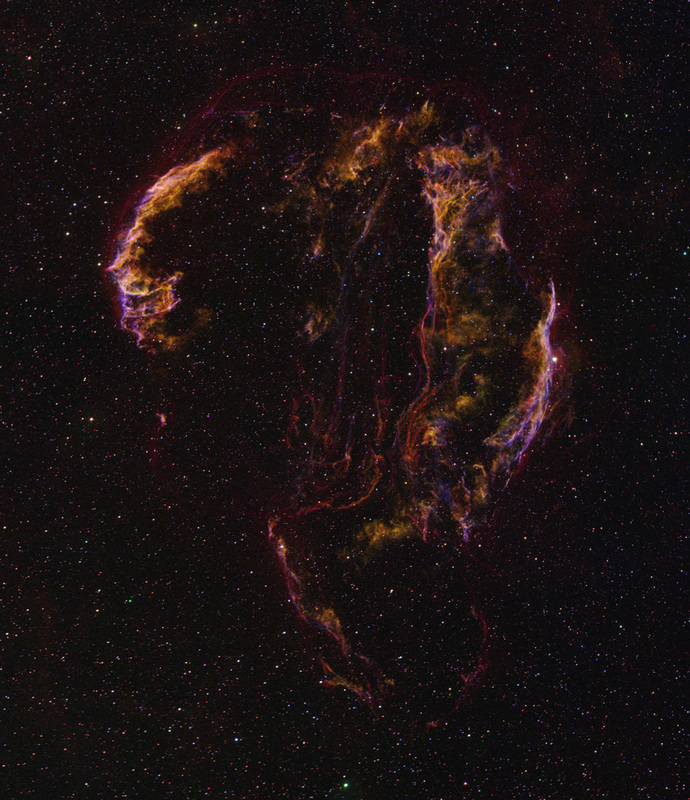 Call it the NGC 6992 & 6960, Cygnus Loop, Witch’s Broom or Filament Nebula; the remains are that of a star that exploded 5,000 to 8,000 years ago. Astronomers are having a bit of a time estimating the supernova remnant’s distance from us, which is somewhere between 1,400 to 2,600 ly. Measuring more than 3 degrees (6 lunar diameters) in length, its apparent magnitude is a challenging 7.7. Farther north along the Cepheus-Cygnus border is a wonderful face-on galaxy. NGC 6946 possesses a spiral structure and is populated with bright knots. At a distance of 10 million ly, NGC 6946 has seen its fair share of supernova during the past 60 years. About a lunar width away is a dense open cluster NGC 6939. This star group resides in Cepheus and both are a treat in a wide angle ocular. And if open clusters are your forte, do drop by the Double Cluster in Perseus. Low power eyepieces will show both clusters in the field of view. Catalogues as NGC 869 and NGC 884, they are estimated to be located 7,000 and 7,400 ly from Earth. In a large instrument and a black sky, the pair resembles diamonds on black velvet. NGC 7008 is another very interesting planetary. Owners of 20 inch telescopes have claimed to see structure and colour in this 2300 ly dim object. Its visual magnitude is listed at 13.3 and is 1.4 arc minutes across. 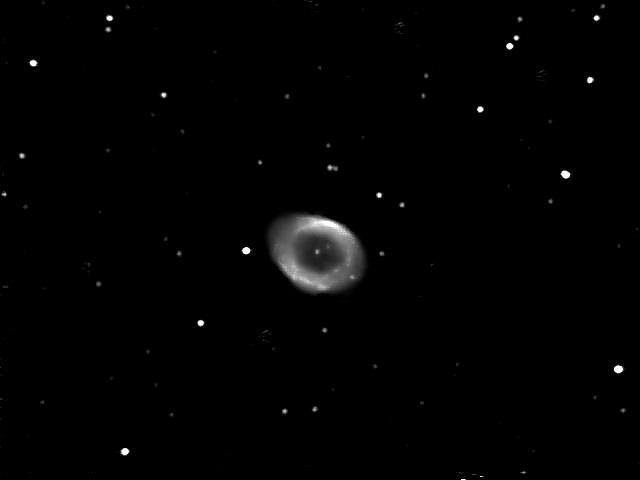 NGC 7008 is also known as the fetus nebula form is resemblance. 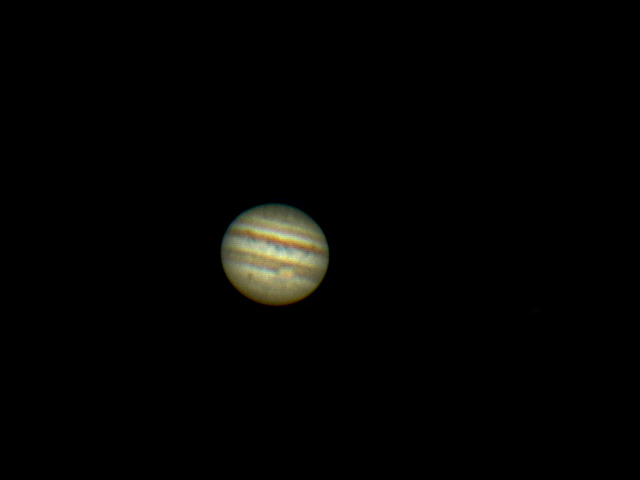 Although Jupiter’s opposition occurred last month, it is still at prime viewing. The down side is the planet is at most, only 22 degrees about the horizon when on the meridian. This spells out turbulence, making photography very difficult. However, with each passing year the king of planets is moving back up the ecliptic, meaning it will be nice and high in about five years from now. Aside from visually inspecting its belt structure, the four Jovian moons keep their rhythmic dance around its parent. These can be seen on any night. From time to time, we are fortunate enough to witness a moon transiting across Jupiter’s face. Depending on what moon is crossing, it might be a challenge in seeing it but its tiny inky black shadow is quite evident. On the night of August 6/7, the moon Io will begin its trek across Jupiter at 11:00 p.m. EDT. If weather permits, I will be broadcasting the event from my observatory. If you do not own a telescope or if clouds prevent you from observing, simply follow the link from my website. In fact, I astrocast on most clear Friday and Saturday nights starting about an hour after sunset eastern time. 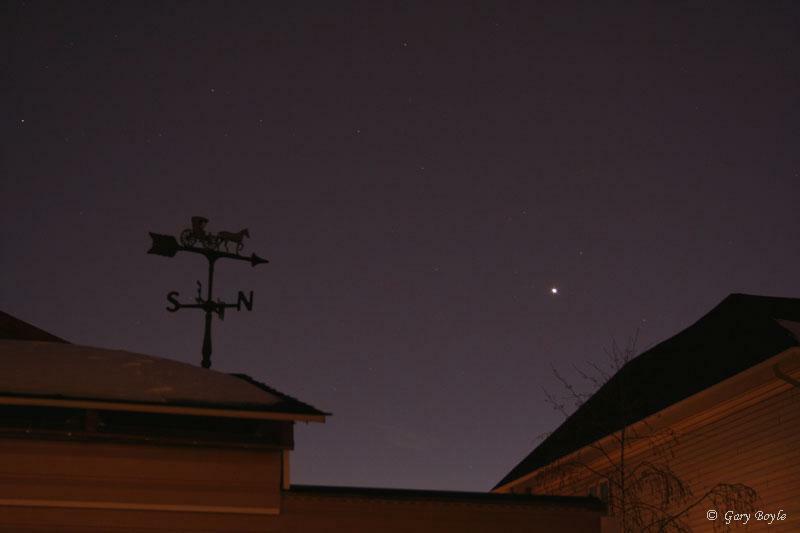 Venus is slowly pulling away from the Sun’s glare and is now seen low in the western sky after sunset. Being close to magnitude -4, it will definitely not be hard to spot. Since it is so low, it would make a nice photo opportunity with a tree etc. In fact, a very thin 5% moon will be south of Venus along with Mercury and Mars in the area. The annual Perseid meteor shower is slated for the night of August 11/12. The 75% gibbous moon will interfere with faint meteor till about 12:30 a.m. locally. Then the show should pick up to enjoy the predicted hourly rate of 100 per hour. Until next month clear skies everyone.